When I first saw the picture prompt for the day from The Haunted Wordsmith, I must admit I was slightly puzzled. “What on earth is that?” was the thought that went through my head. And then I realized…I might well be looking at a close-up of one of Kim-Joy’s “space-turtles”! If you have no idea what or who I am talking about – fear not! All will be explained. I am hoping you are familiar with “The Great British Bake-Off”…a show where twelve amateur home bakers become contestants, displaying their skills and tantalising the nation’s taste buds from within a large tent. I am not going to talk about the final just in case anyone has not had chance to see it yet. Well meet the delightful Kim-Joy, one of the contestants from the 2018 series of GBBO. Apart from the fact that she is a talented baker and has remarkable creative skills she seemed such a sweet lovable character and we watched as her popularity with viewers began to burgeon over the weeks. Kim-Joy had the most extraordinary imagination when it came to her culinary creations. At one stage I heard Kim-Joy described as “the rainbow encrusted dark horse of this year’s competition”. Take for example, the brief set for the contestants in dessert week, which was week four of the competition. For their dessert show-stopper, the judges asked the contestants to create a chocolate sphere encasing a surprise dessert that would be revealed once a hot sweet sauce was poured over the chocolate sphere to melt it. Hmm. Because that is something home-bakers produce every other week. 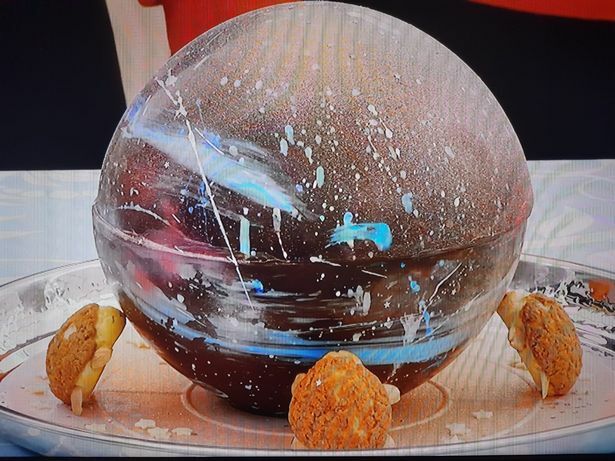 I thought this was quite a tough challenge so early on in the competition, and a challenge some of the contestants had a melt-down over – well at least their chocolate spheres had a melt-down! But Kim-Joy literally wowed us with her incredible concept. This is the outside of her chocolate galaxy. I believe it was a hot caramel sauce (don’t quote me on the hot sauce, I was completely distracted by the rest of the dessert) that she poured over her chocolate sphere revealing her choux pastry “space-turtles”, yes that is right, turtles who live in outer space and drink cocktails (well we are presuming so since they all had cocktail umbrellas, although perhaps the cocktail umbrella is an instrument they use in their space-travels!). Absolutely as you would expect from the wonderful Kim-Joy, whose attention to intricate detail was remarkable, every “space-turtle” had a little tiny face drawn on to it. I cannot find a photo of the stack of “space-turtles” that were hiding inside the chocolate sphere, But in the picture above, you can see three of them propped up against the chocolate galaxy that encased the rest of their galactic choux crew. This was one of the Kim-Joy creations I will remember for the longest I have to admit. However, she has been a delight to watch and I don’t think anyone would deny how impressed they were by her intricate productions and wonderful imagination. She was just as sweet as her cakes and biscuits looked to be. I had never heard of “space-turtles” before…but when I typed that into Google’s search engine…it’s clear that I am out of touch. “Space-turtles” are quite a presence it seems! What on earth am I going to do on Tuesday evenings now that the series is over? It just will not be the same! I have to admit I loved the old crew very much, But they picked some lovely folks to make up the new team of presenters and co-judge. It was a bit strange getting used to the slightly new feel last year, but this series has been a delight because the twelve contestants had such gorgeous personalities. I think one of the new presenters Noel Fielding who I think was a very unexpected choice for GBBO is amazing and has become incredibly popular. It is sometimes hard to figure out what the British public will warm to, but they have definitely warmed to Noel. And ha! What a coincidence, I love blogging synchronicity! I mentioned Noel Fielding (soup, soup, a tasty soup) in my post today 🙂 as someone I’d like to meet but the meeting would probably not work out well. I think I’m a little bit too weird for him, and he’s a little bit too normal for me. I haven’t watched terrestrial TV in awhile, but when I did I used to watch the Bake-Off. Hours of fun watching other people sweat, panic, and make a mess… then pull off wonderful saves! Also used to watch Masterchef and whatever the other one was called until that snooty chef ruined it by snooting all over everyone. It’s always intriguing to look at shows through the eyes of someone else, and I like how your eyes watch… omg that sounds creepy, but I’m leaving it in the comment anyway. Don’t you worry…I am not creeped out…I totally understand you. I have warmed to Noel Fielding so much…in all honesty I used to think of him in the weird category, but seeing him on GBBO has made me very fond of him. I don’t mind weird, but I do appreciate a bit of normal to make me feel relaxed with someone. I thought this year’s contestants on GBBO were adorable. My own favourite was Bryony. I loved her sense of humour and Bristolian accent from Day One…and liked her attitude so much. I would buy her a pint any day! I shall check out your soup post. I was wondering what soup had to do with it! LOL! Thank you for explaining! Ursula….your posts are fantastic…longer than the scarf my gran knitted me…but a really great read! 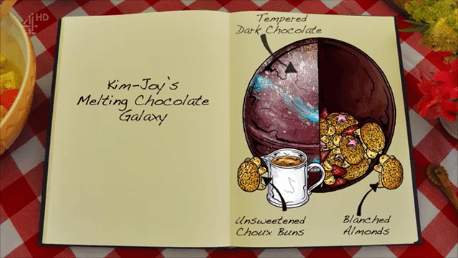 When Kim-Joy said she was going to make choux pastry space-turtles and put them inside her chocolate galaxy sphere…everyone did a double-take. But I think a lot of us had that reaction to her at first. As time has gone on I think we have all come to expect the unexpected from her. One week she said, I need to boil these eggs until they are really hard…because they are going to become bumble bees. She used lots of cute animal designs on her baking creations all with little elaborate facial expressions. She was certainly unique and lovable!